The Jonjo O’Neill-trained Sunnyhillboy justified strong market support to land the Fulke Walwyn Kim Muir Handicap Chase. Alan Berry, a key member of O’Neill’s staff was enjoying his second Festival success, having won the 2007 National Hunt Chase on Butler’s Cabin. “He’s a brilliant little horse and he loves this place. He has been unlucky a few times but he has been a brilliant horse for the yard - a real, tough, honest horse,” said O’Neill. “He’s not very big and he needs all the help he can get. I always feel that Old Vics go better on better ground, but he stays well. He was slow to get the hang of jumping fences but he jumps well now. “If I had the choice, I would have gone for the Pertemps Final but he didn’t get in, so we were left with this race. We were very happy with him and everything went well for him. 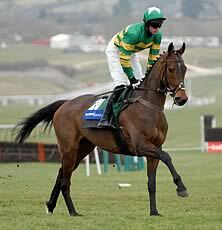 Runner-up Becauseicouldntsee is on course for the John Smith’s Grand National, according to trainer Noel Glynn. “You’d rather be in pole position but I’m happy enough with that and it will be a different proposition with 10st 3lb at Aintree,” said Glynn. “The winner won a stone in hand so we were never going to beat him but our horse’s confidence is back, which is the main thing. 1. The Kim Muir Amateur Riders’ Chase was introduced to the National Hunt Meeting in 1946 by Mrs Evan Williams, sister of Kim Muir, a young cavalry officer who lost his life in the early years of the Second World War. 2. The addition of Fulke Walwyn to the title of the race occurred in 1991, reflecting the career of Cheltenham's most successful trainer. Walwyn trained 211 winners at Cheltenham and a record 40 at The Festival - his haul included four Gold Cups, two Champion Hurdles and seven Cathcart Challenge Cups. 3. Cool Ground is the only horse to have progressed from this handicap to a Betfred Cheltenham Gold Cup victory. 4. Most of the top amateur riders appear in the winners’ list, including some subsequently well-known professional jockeys and trainers. Gay Kindersley, John Oaksey, Nick Gaselee, Roger Charlton, Michael Dickinson, Ridley Lamb, Ted Walsh, Jim Wilson, Simon Sherwood, Gee and Marcus Armytage, Robert Thornton, Adrian Maguire, Seamus Durack, Ken Whelan, David Crosse and Robert Walford are among the familiar names.